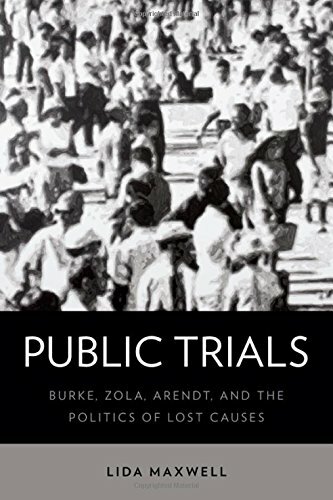 [PDF] Public Trials: Burke, Zola, Arendt, and the Politics of Lost Causes | Free eBooks Download - EBOOKEE! Description: There are certain moments, such as the American founding or the Civil Rights Movement, that we revisit again and again as instances of democratic triumph, and there are other moments that haunt us as instances of democratic failure. How should we view moments of democratic failure, when both the law and citizens forsake justice? Do such moments reveal a wholesale failure of democracy or a more contested failing, pointing to what could have been, and still might be? Public Trials reveals the considerable stakes of how we understand democratic failure. Maxwell argues against a tendency in the thinking of Plato, Rousseau and contemporary theorists to view moments of democratic failure as indicative of the failure of democracy, insomuch as such thinking leads to a deference to authority that unintentionally encourages complicity in elite and legal failures to assure justice. In contrast, what Maxwell calls "lost cause narratives" of democratic failure reveal the contingency of democratic failure by showing that things "could have been" otherwise and, with public action and response, might yet be. A politics of lost causes calls for democratic responsiveness to failure via practices of resistance, theatrical claims-making, and re-narration. Maxwell makes a powerful case for the politics of lost causes by examining public controversies over trials. She focuses on the dilemmas and diagnoses of democratic failure in four instances: Edmund Burke's speeches and writings on the Warren Hastings trial in late 18th century Britain, Emile Zola's writings on the Dreyfus Affair in late 19th century France, Hannah Arendt's writings on the Eichmann trial in 1960's Israel, and Kathryn Bigelow's recent narration of (the lack of) trials of alleged terrorist detainees in Zero Dark Thirty. Maxwell marshals her subtle, historically grounded readings of these texts to show the dangers of despairing of democracy altogether, as well as the necessity of re-narrating instances of democratic failure so as to cultivate public responsiveness to such failures in the future. No comments for "[PDF] Public Trials: Burke, Zola, Arendt, and the Politics of Lost Causes".